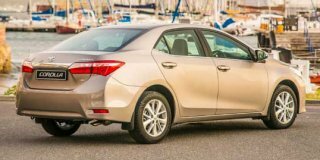 Security is our highest priority, this is why our Toyota Corolla features the most advanced features on all the standard models. The new Corolla comes with BAS (Brake-Assist System), EBD (Electronic Brake-force Distribution) and ABS (Anti-lock Braking System). On selected models, the Corolla also comes with HAC (Hill-Assist Control) and VSC (Vehicle-Stability Control), ensuring optimum safety on whatever terrain you may come across.